Hear the difference. Blue car is early muffler, maroon car is second design stock. 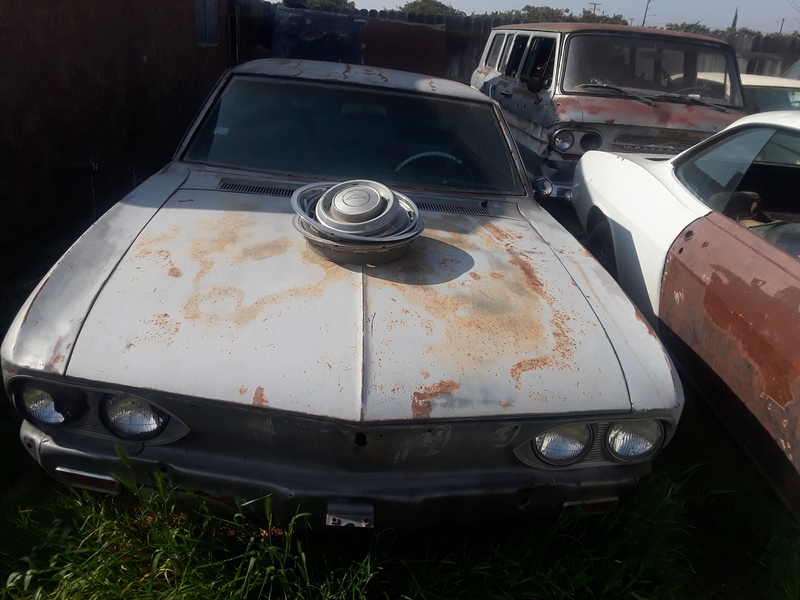 My dad told me that a lot of the hot rodders back in the day wanted the muffler from a turbo Corvair because it flowed good and was more stealthy than a lot of other performance mufflers. The stock 65 muffler, at least the one sold by Clark’s as a repro, is exceptionally quiet, especially under boost. BUT.....it is pretty restrictive too; the inlet is 2-1/2” and once inside the muffler it tapers down to 2”. GM also designed them to produce backpressure to help limit boost levels. As for the muscle car guys using them, I remember a guy who worked for my dad that had an L-88 powered SS Chevelle that ran them, it sounded great, and was pretty darn quiet considering the power. No muffler on my turbo, and it is not at all objectionable, and very quiet under boost. > objectionable, and very quiet under boost. Boost was limited primarily by the carburetor. The muffler was very free flowing. I've taken my muffler off and only get another 1-2 psi of boost. I'd like to know if the Clark's repro is identical to the original internally. It looks nice, but does it flow the same? Well, to be more technical, the boost was limited by the carb and the entire exhaust system for that matter. It was very easy to turbo the Vair, plenty of room for it, and cheap to produce exhaust parts, but the exhaust system is very restrictive. 1-2 more psi with the stock carb is pretty good for just removing the muffler. I think tests showed that they designed the exhaust to produce 15psi back pressure, in order to limit boost to 10 psi with a stock carb. Run a bigger carb, then pull the muffler and see how much more boost you make. Will someone look at an original turbo muffler and see if it tapers to 2” inside? 50 plus years since production, and few of those guys still kicking around, it is really hard to know anything for sure. I can't argue with our Turbo Experts who have hands-on experience with swapping out the carb for increased turbo boost pressures. BUUUUUT, like Rocco, I have read in multiple Corvair sources that the "Original Corvair Turbo Muffler" was designed to have great flow characteristics, . . . . up to a certain CFM, and then it became rather restrictive from that point and up in order to keep boost under control. 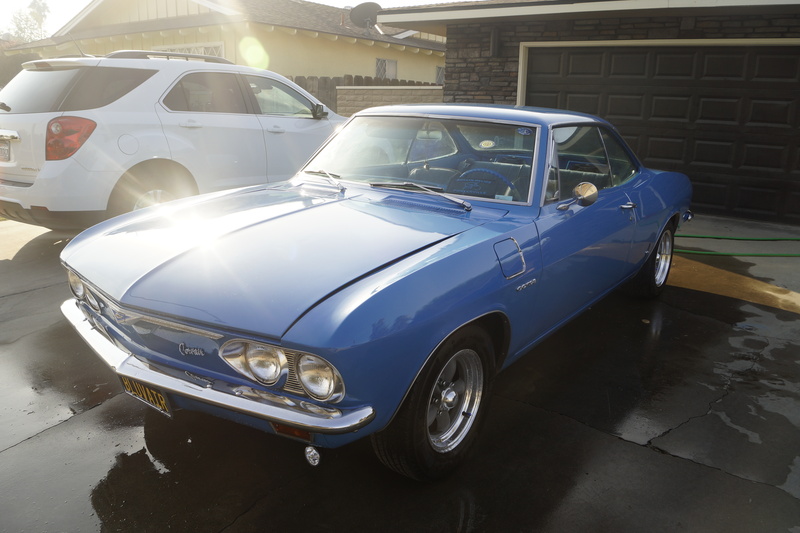 Most "Turbo Mufflers" on the market today are variations of the BASIC Corvair design, but are NOT true turbo mufflers in the sense that they are built to the same specs as a CORVAIR Turbo Muffler. I too would really like to see the internal dimensions of a FACTORY ORIGINAL Corvair Turbo Muffler. After reading about the supposed built-in restriction at higher flows, I always wondered how this affected those old school hot-rodders that installed Corvair Turbo mufflers, and started the "Turbo Muffler" marketing craze! I have been offered a NOS stock turbo from Al Lane (Lane66m) and I am buying it. When it arrives I will check the restriction inside as people have wondered about that. It's still in the original box so he doesn't know. Eric has purchased my NOS turbo muffler. Donna will be shipping out tomorrow morning while I take the truck to the body shop. If Eric gets the chrome tailpipe tomorrow from the source I found, he will have the stock system for under the eBay NOS muffler price. I might have both. Will have to check later today. Looked at Clark's catalog and I have both. My down pipe is ceramic coated though. I also have a inlet pipe that is ceramic coated for sale. Both previously listed in another discussion. Edited 1 time(s). Last edit at 04/15/2019 02:09AM by Lane66m. > a lot of other performance mufflers. Being an old guy, I remember the same thing. We all wanted a Corvair turbo muffler. My down pipe is wrong, too? Or is the expectation just that removing and replacing the existing muffler won't leave enough pipe material to work with? My current muffler hangs from the shroud, so I guess yeah, I need a hanger. Proper hanger for the muffler you just purchased is Clarks C255R. 2 bolts secure it to the front of the muffler. Hanger is mounted on stud and bolt on back of RH head and one bolt from RH side shroud. I just sent you a couple PMs on this and what brackets I had (none turbo muffler). Did you get the right tailpipe for the muffler? You could possiblly clamp around the chrome tailpipe until you can get the right bracket down the road. Not sure since I never got that far. Eric: I felt like the exhaust system was a never ending puzzle when I tried to figure out what I needed with what I had. Totally confusing with all the advice that was given of what will and will not work together. I finally sold the turbo Corsa as my time was needed on our Camaro. Edited 1 time(s). Last edit at 04/16/2019 09:52AM by Lane66m. > guess yeah, I need a hanger. I'd need to see a better picture of the lower part of your down pipe to help determine if its correct for the second design muffler. The correct tailpipe is significantly longer (if you choose to use it). After re-reading this entire thread I can't believe everyone missed the obvious. Blue shrouds are much louder than the factory black. I have a V8 Malibu with a 3" exhaust and Flowmaster. It's about as loud as I can take. It sets off car alarms in parking garages. My wife always comments how much she likes the car when we go somewhere in it. > are much louder than the factory black. > go somewhere in it. No no no. Blue is quiet like the sea and has a calming effect. That's why it's used in birthing rooms. I was wondering if you had an update for us yet. The muffler should have been there Monday.